On Sunday (24/4/17), the Jerusalem Municipality deposited for public review a special plan (no. 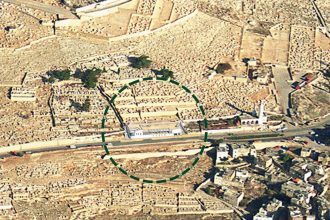 470484) for the confiscation of 1,300 square meters in the Jewish cemetery in the Mount of Olives, adjacent to the Ras El-Amud mosque. The plan, initiated by the Jerusalem Development Authority (JDA), is meant to allow the confiscation of parcel no. 10 in bloc no. 29991 for public use, in order to allow the construction of a visitor center. 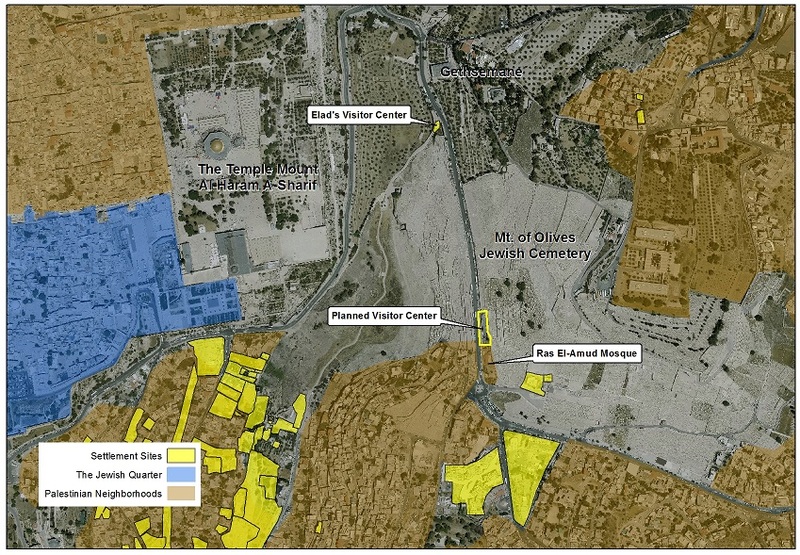 The area of the plan is a highly sensitive one, located at the heart of the historical basin of Jerusalem, 300 meters from the Old City and the Temple Mount/Al-Haram A-Sharif, and next to the mosque of the Ras El-Amud neighborhood. In order to avoid the regular planning procedure, which requires the approval of a detailed plan by the Regional Planning Committee, the JDA employed a highly unusual procedure of a special plan for confiscation, which only requires the approval of the Local Planning Committee. Unlike the Regional Planning Committee, which is comprised of professional representatives from different government bodies, the Local Planning Committee is part of the Jerusalem Municipality and it is a political body of elected members. The confiscation of lands for public use can be done by the municipality when there is an approved plan designating the land for public use. Yet, in the case of the plan in the Jewish Cemetery of Mt. of Olives, there is no such designation. So in order to confiscate the land the special plan is being approved. This special plan that was deposited yesterday for public review (plan no. 470484), giving the public 60 days to file objections to it. As mentioned above, it is within the authority of the Local Planning Committee to approve the confiscation. After the confiscation, the JDA will be able to apply for a construction permit directly from the Local Planning Committee, without the need to approve the construction plan and without public review or publication. The permit will be based on an old plan from the 1970’s (plan no. עמ/9) which defines the area as a “preserved cemetery” in which it is allowed to build “monuments and structures related to the cemetery”. Hence, it seems that according to the Municipality’s interpretation, a visitor center could be considered a “cemetery-related” structure, which does not require special planning. 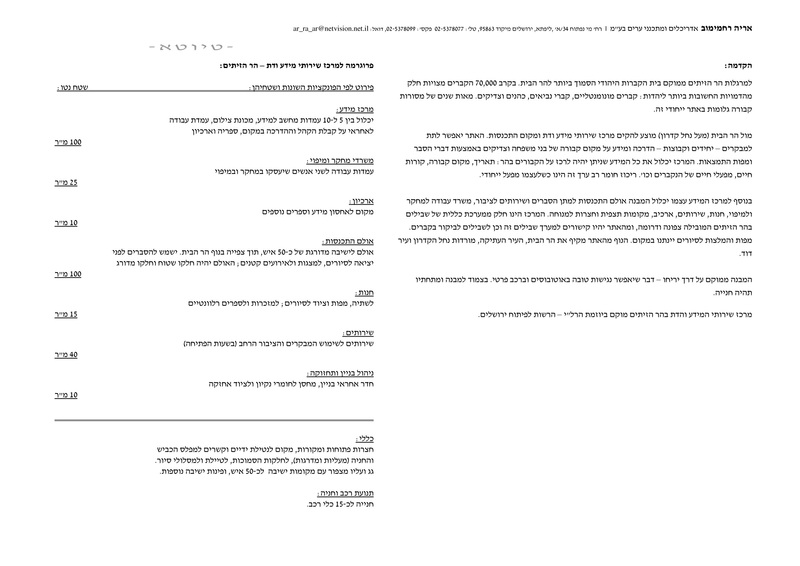 To read the list of planned uses of the building (in Hebrew) – click here. The construction of a visitor center in the Mount of Olives is part of the wide efforts put by the government to change the public domain in the area of Ras El-Amud and the Mount of Olives. It is part of a governmental plan of over one billion shekels to “deepen the Israeli hold of Jerusalem,” through the development of touristic and archaeological sites in and around the Old City. The increased presence of Israelis as tourists in the Palestinian areas of Jerusalem — while ignoring the complexity and the importance of these same sites to other cultures and other nations — is another type of settlement, with far-reaching implications not only for daily life in East Jerusalem but also on the future of the conflict and the possibility to reach a compromise in Jerusalem. It should be mentioned that the Elad settler organization is running a big-scale touristic project in Mt. of Olives, including the small visitor center in a temporary structure at the side of the cemetery. It seams that it is not by accident that the government is now promoting a similar project that would be serving the settlers’ interests and goals. For more information on the touristic settlement see here.